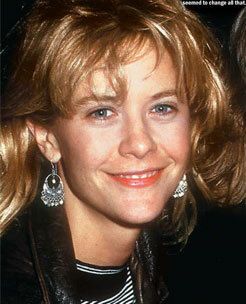 Margaret Mary Emily Anne Hyra , professionally known as Meg Ryan, is an American actress and producer. Ryan began her acting career in 1981 in minor roles, before joining the cast of the CBS soap opera As the World Turns in 1982. Subsequently, she began to appear in supporting roles in big screen films during the mid-1980s. Her performance in the romantic comedy When Harry Met Sally… (1989) brought her widespread attention and her first Golden Globe nomination. What happened to Meg Ryan’s Face?!? Meg Ryan was born a natural beauty, so why did she have to go and mess up a good thing? Much speculation has been made as to what cosmetic procedures she has undergone. Most obvious is the enlargement of her lips, let’s take a look. In our opinion Meg most likely started with lip injections, and liking the outcome, choose to go for more “permanent” lip implants. I parenthesized permanent because it looks as though she has had most of the implant removed in the last picture. A good choice in our opinion. It has also been speculated that Meg has had cheek implants. While it’s true her face does look slightly fuller than before that could be a result of fat grafting, as in a volumetric face lift. In addition her face looks very taut so she most likely had other tightening procedures such as a forehead lift and neck lift. It’s to bad Meg went a ruined a perfectly beautiful face. What other plastic surgery procedures do you think Meg has undergone?